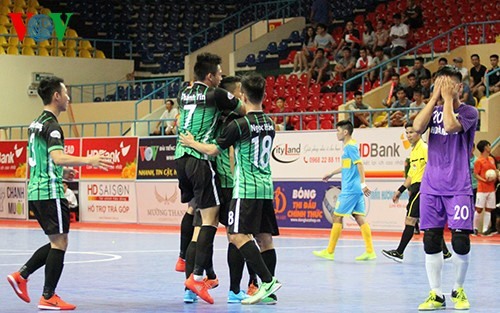 HÀ NỘI — Hoàng Thư Đà Nẵng beat Sanna Khánh Hòa 1-0 in the second day of the National Futsal (indoor football) Championship yesterday in HCM City. Sanna Khánh Hòa was considered a strong team due to their better experience in both local and regional tournaments. They showed their power right after the whistle. However, their players, Nguyễn Nhớ, Thành Đạt, Minh Hiếu, and Khắc Chí, failed to score a goal throughout the match. Just two minutes before the end, Hoàng Thư Đà Nẵng’s Trần Văn Trung converted a corner kick by teammate Ngọc Hào into the only goal. National team keeper Nguyễn Đình Ý Hòa was startled and let the ball go through his hands into the net. Sanna Khánh Hòa tried the power-play tactic to score a goal, but two minutes were not enough. It was Hoàng Thư Đà Nẵng’s second win in a row, while it was Sanna Khánh Hòa’s second loss. “It is the rule of football. If you attack a lot but could not score, you would be a loser. Sanna Khánh Hòa still has a chance to fix the problem in the next matches,” said coach Đặng Đình Khang. On Hoàng Thư Đà Nẵng’s side, coach assistant Bùi Ngọc Tú said the win resulted from his team’s hard work and strong determination. His team then won over Sanna Khánh Hòa, a veteran team in national futsal with remarkable success. In the other matches, Sài Gòn FC was defeated 3-4 by Hải Phương Nam Phú Nhuận, in a match that saw teams taking turns in scoring goals.